Many of us spend our 20s trying NOT to get pregnant and our 30s desperately trying TO get pregnant. And while 40 percent of pregnancies are unplanned, if you’re in the 60 percent trying to conceive, you want to ensure that you’ll have a healthy pregnancy, easy delivery, and an even healthier baby. But do you know that 15 percent of couples in the United States have trouble conceiving? Getting your period every month when you’re trying for a baby can be deeply depressing. So many of the 30-something women in my practice have been on oral contraceptives for years, living goal-oriented, high-stress lifestyles and getting all their “ducks in a row” before they start contemplating a family. “Infertility” is not being able to conceive after 12 months of actively trying. Sadly, so many women don’t realize they have medical problems until they are trying to conceive and having trouble doing so. There are many factors that contribute to infertility, but I always take it back to the basics with my patients and start with nutrition. Although excessive fat can hinder fertility in both men and women, by limiting sperm count in men and increasing hormonal problems in females, a recent study showed that women who ate full-fat dairy were more fertile than those eating nonfat or low-fat dairy. Dairy isn’t for everyone, but for those who tolerate it well, always focus on full-fat, organic, grass-fed dairy. You have to eat fat and have some fat on your body in order to get pregnant. Luckily, there are a ton of healthy fat options. Try eating wild Alaskan salmon, which is rich in omega-3 fatty acids, and sprinkle coconut oil in your food whenever you get a chance. 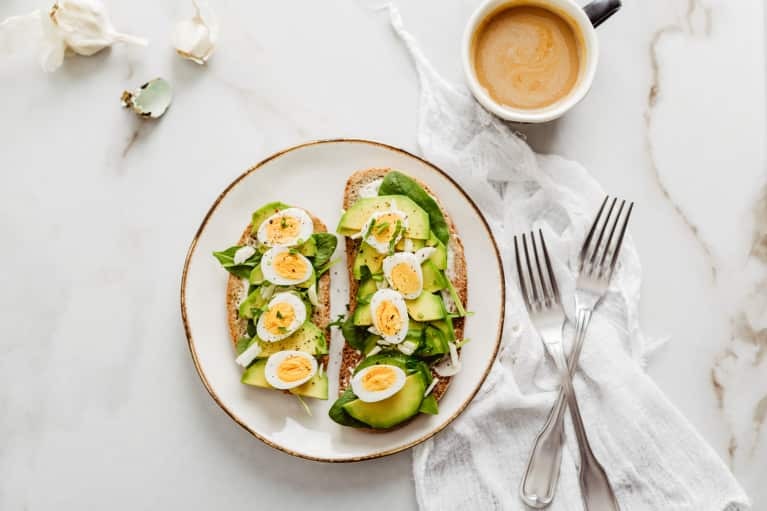 There is a lot of controversy around coconut oil and saturated fats right now, but if you eat it in moderation (1 to 2 teaspoons a day), you’ll be getting a daily dose of good fat that your body needs fat to make adequate amounts of hormones. Saturated fat is also stored in breast milk, which is something additional you want to keep producing postpartum. Trans fats should always be avoided, as they have been associated with increased inflammation in the body, which can inhibit ovulation. Eating healthy, plant-based protein and limiting processed meats is imperative for a healthy fertility diet. Consume foods like beans, nuts, and legumes daily, as well as fish and eggs, which—according to a large study—have no negative impact on fertility, as opposed to red meat, chicken, and turkey, which should be limited. If you do eat animal protein, ensure that it’s organic, free-range chicken or grass-fed beef whenever possible. Although I just told you to eat protein in moderation, it’s important to remember that vegans and vegetarians aren’t automatically healthier. Oftentimes, my vegan patients are deficient in fat as well as B12, iron, vitamin D, and cholesterol—which can inhibit hormone production when trying to conceive. They also tend to have lower body weight, a factor that can hinder pregnancy. It’s important to get essential vitamins and minerals from veggies at every meal. Try aiming for seven to nine servings of veggies each day with a variety of colors, phytonutrients, and antioxidants. It’s important to get your nutrition first through foods before supplementing. Add veggies to your smoothies, juices, omelets, salad, soups, and even snack on them. Make veggies an integral part of your day so you always get enough. Eating more fiber and limiting high-glycemic-index foods are both important pieces of the fertility puzzle. Fiber-rich foods help you stabilize your blood glucose and maintain a healthy weight, preventing insulin spikes and hormonal imbalances like PCOS due to elevated testosterone. Fiber also aids in GI detoxification and acts as a prebiotic, which is essential for females who are estrogen dominant and need to get rid of excessive xenoestrogens associated with problems like endometriosis and fibroids. The secret, however, is to make sure you’re getting enough natural fiber through a plant-based diet instead of through excessive androgynous processed fiber supplements.